Inspired by the vibrant Parisian nightlife of the turn of the last century, master perfumers Puredistance have recently launched their fourth perfume Opardu, which pays respect to a dynamic age of opulence and romance. Bringing forth feelings of tenderness and seduction, Opardu is the brainchild of Puredistance Director Jan Edwoud Vos and the creation of New York perfumer, Anne Buzuntian. Inspired by a painting by Dutch Fauvist/painter Kees van Dongen of a bouquet of flowers, Buzuntian set out to create a scent that ushered in a sense of nostalgia and longing... a perfume that evoked memories of love. Opardu is a bouquet of tranquilizing flowers - a rendering of blossoms that captivate and inveigle within seconds of being applied to skin. A bewitching tuberose absolute dances over gardenia, Bulgarian rose and purple lilac... the sum of which feels staunchly French and extremely enchanting. It's heart is a quickstep of carnation and jasmine - spiralling florals which are both heady and commanding, and yet somehow virginal and chaste at the same time. As far as feminine florals are concerned, this is how I would imagine all women should smell... graceful and self-restrained, but with a transfixing gaze of dissoluteness in her eyes. Puredistance continue to produce exceptional perfume, making it one of my most appreciated independent perfume houses. Their scents are timeless and beautiful. Opardu is now available in 17.5ml and 100ml sizes in the Puredistance webshop and at select retailers. I don't know how Parfums Divine have managed to slip stealthily beneath my perfume radar until today, but I, for one, am thrilled that their brand new masculine L'Homme Infini created a blip on my monitor. "Simply by word of mouth, DIVINE perfumes have magically entered the lives of women and men all over the world". And so it has, mine. Parfums Divine have received much praise, it would seem, for both their masculines and feminines. L'Homme de Coeur and L'Homme Sage are the notable forefathers to L'Homme Infini - their latest offering, earmarked for a November 12th release. Parfums Divine Creator / Perfumer Yvon Mouchel appointed perfume maestro Yann Vasnier to bring to fruition his most recent innovation. 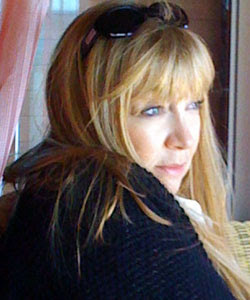 Vasnier's impeccable resumé includes the creation of scents for Tom Ford, Comme des Garcons, Arquiste, and many, many more. L'Homme Infini - conceptually - is a man who has the horizon of life stretching far before him - a man who can invent the future. And whilst this reads somewhat as simple marketing prose, L'Homme Infini the fragrance, does in fact, feel rather optimistic. It has a very engaging opening... lush aromatic greens of coriander leaf and elemi feel abundant and proffer a sense of open space. It is deeply aromatic, with warm oaky tones and a prickle of pepper that meets the nose from the get-go. Whilst not listed amongst the official olfactory notes, there is almost a hint of dried bay leaves present too... the opening synthesis of accords skipping alongside other arresting offerings like Monacle x Comme des Garcons Scent 2: Laurel. A cozy cedar/vetiver heart lends some staunch masculinity, and a subtle huff of agarwood, a deeper complexity to the nucleus of this perfume. There are ambery, resinous nuances in the trail, furnished by fragrant benzoin. 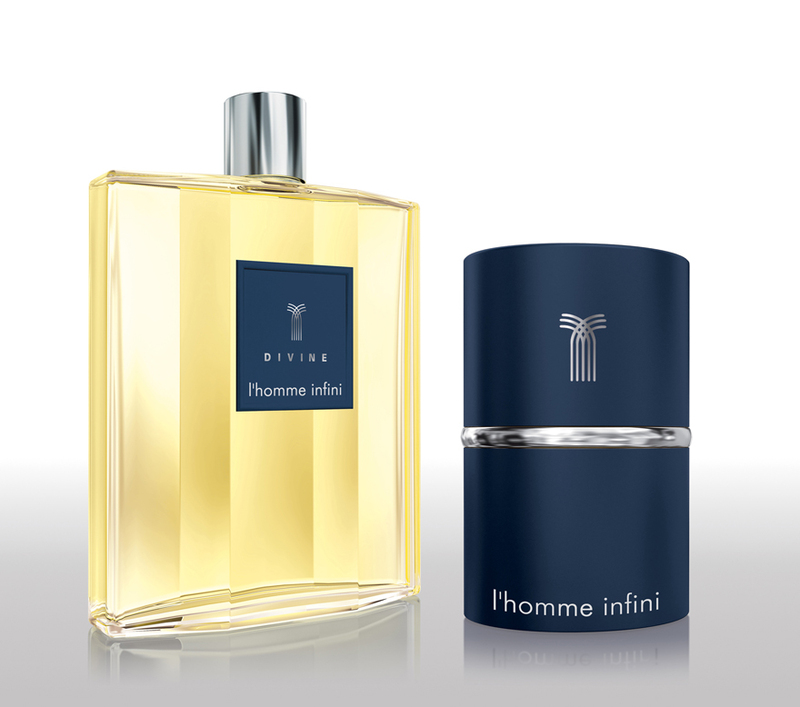 On skin, and after a time, L'Homme Infini wears very much like a favourite piece of clothing. A comfortable woolen horse-riding jacket, perhaps... one imbued with the smell of the trees, rushing wind, dewy mornings and leafy dales. Somehow, it feels deeply individual... a perfume that essentially becomes bonded with the wearer. A wearer who has the horizon of life stretching far before them - a wearer who can invent the future. L'Homme Infini launches in Parfums Divine boutiques and in their e-shop on November 12. It will be made available in 50ml, 100ml and 150ml sizes. This image is the author's own, so please do not use without permission. French jeweller/perfumer Olivier Durbano has an insatiable approach to his work. His eye-popping collars of semi-precious stones are constructed with both a masterful hand, and a keen consciousness of the raw materials he is working with. In 2012, Durbano chose the stone Heliotrope to feature in his work, and true to his own tradition, it also served as the inspiration behind his latest perfume release, which he revealed at Fragranze in Italy last month. Heliotrope is known perhaps more commonly as Bloodstone, or Dragonstone; a variety of chalcedony which is chiefly a deep green colour, speckled with rich red jasper. Worn as a talisman to protect against the evil eye, and to aid with blood-related disorders, it has been a stone coveted throughout the ages by both Christians and pagans. As with all of Durbano's perfumes - one can't help but recognise a hint of antiquity at hand. Not antiquity so much in the sense that his creations are like the classical pillars of perfumery, but rather "antiquity" defined in a primitive sense. Heliotrope is such a scent... one that commands instant reflection... it conjures scenes from archaic ages... of warring empires and primordial battles; of far-flung cities buried in the sand; of the prehistoric asclepions and sanctuaries of healing. Perhaps more than any other of his accomplished perfume releases, Héliotrope not only memorialises this semi-precious stone, but also tells an ancient narrative. One does not quite know what to expect when first applying this deep crimson juice, or perhaps if one does, I am almost certain their assumptions would be wrong. Heliotrope opens with a sharp mandarin accord, but it is instantly diminished by a combustable chilli-pepper warmth. A component of many fragrances from the Near East, saffron is a major player here... it is heady and piquant. It's texture is syrupy, almost medicinal in nature, which adds complexity and a sense of luxuriousness. I sense florals - angelica, magnolia, heliotrope - swimming at its heart, but there is also a curious sense of green. A damp, sodden woodsy green, like the smell of the forest floor after a deluge. I've not smelled Nagarmotha as an isolated raw ingredient, but it is listed as a component here, and I recognise it from other scents like Amouage's Opus VI and Mona di Orio's Oud, and I feel it contributes to this grassy, woody, slightly astringent aspect. Notes of sandalwood and cedar also bring with them a bountiful sense of comfort. As it develops, Heliotrope feels multi-tiered with layers of warmth and coolness... a huff of musk lends a luke-warm "organic" feel... like the smell of skin at blood-temperature. I ponder for a moment, wondering if this was a deliberate (and genius) attribute to include. Durbano's remarkable and much loved "house accord" of incense and tree resins makes a firm appearance in Héliotrope's drydown... lavish tendrils of myrrh, oliban and benzoin which furnish each of his perfumes with an exquisite earthy, mineralic quality. 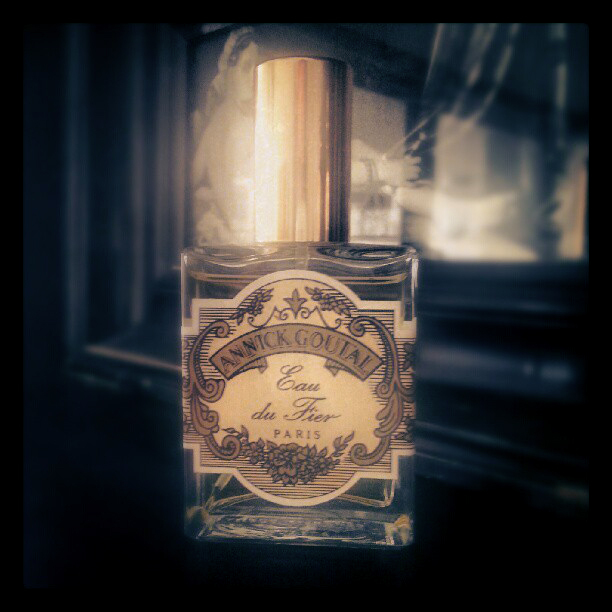 There is something resolutely personal about how this perfume blossoms over time... it feels both intimate and curative. I imagine an ancient spa or asclepion with clay pots full of salves, unguents and balms that are rubbed into tired muscles and anoint the wounds of ancient heroes and heroines. Héliotrope, the perfume, stays true to the stone's metaphysical purpose... is indeed reparative and protective. Once again, Monsieur Durbano's incomparable cognizance of stones and their spiritual meaning makes for a compelling and thought-provoking creation. One of his very best. In-house Annick Goutal nose Isabelle Doyen has a resumé of perfumed creations that reads like a shopping list of the rich and rare. Having studied as Goutal's apprentice prior to her passing, Doyen inherited her master's keen intuitiveness and passion, which translate into a portfolio of fine fragrances that are resolutely French in their approach. In 2000, Goutal launched the polarising masculine Eau du Fier to a mixed reception. A scent that focuses chiefly on the marriage of organic birch tar and black tea, Eau du Fier is quite possibly the blackest, sootiest perfume one might ever encounter. 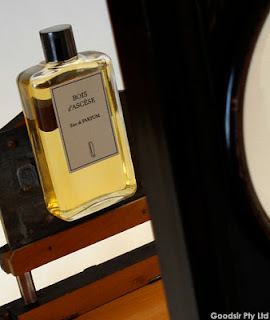 Coming right off the back of a decade of sanitised androgyny in perfume, Eau du Fier proved the absolute antithesis of perfume models that were popular at the time. By 2005, it had been already been retired. In the years since the early 2000's, appreciation for niche, rare and artisanal perfumery has grown exponentially, thanks in part, to flourishing fragrance communities both online and offline. How peculiar that the scent which was globally rebuked in 2003, is now generally regarded by perfume aficionados in 2012 as a triumph, and arguably Doyen's magnum opus. Olfactory notes aside, this fragrance launches from the flacon like a flame-thrower - an impenetrable wall of fire and embers, fed by combustable accelerants. On skin, Eau du Fier is equally as uncompromising... I am automatically transported to mechanic's workshop... I smell of a man who has worked under a car for a whole day; hands blackened with grease lying on a floor littered with oily rags. Open jerrycans in one corner reek of evaporating gasoline, whilst in the other, a fire is burning in a barrel that has been lit with small combustable firestarters. This daydream plays out for 6-8 hours, until a final lingering huff of smoke eventually vaporises from my skin. Black tea and tarry birch are the key components upon which this perfume is built, but one has to turn away from the vivid film playing out in their mind's eye to become cognisant of the individual accords. Doyen's masterful hand has interwoven subtle floral nuances of osmanthus and herbaceous/citrusy facets into this scent, which can only be picked when one knows where to look. Every note is treated like a fine brushstroke, forming a small but integral part of the whole. 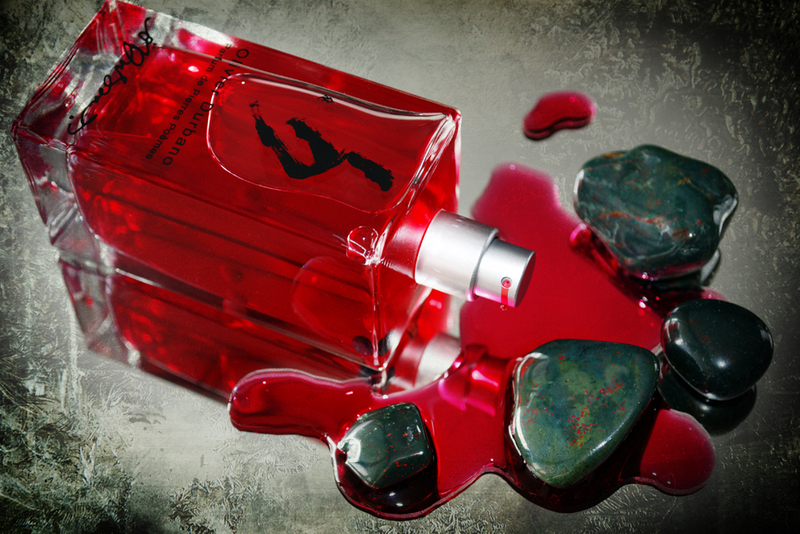 Eau du Fier will unquestionably evoke a response in the wearer. Some will fan the air around them and cough and wheeze, and others will sit, silent, and wait for the visions to begin. If only more perfumes could be as accomplished and profound. Australian milliner Naomi Goodsir has been producing unique and fanciful work for well over a decade - her eye for innovation and her love of using non-traditional materials render her exquisite hats highly desirable and collectable works of art. After a rewarding mentorship working with one of Schiaparelli's protégés, and having collaborated with acclaimed fashion designers the world over, Goodsir's name has fast become synonymous with bespoke couture millinery pieces that both shock and surprise. In 2008, Naomi expanded her imaginative oeuvre to fashion a signature collection of handbags and accessories, and now, in 2012 she is set to make a splash in the independent perfume world. Naomi Goodsir Parfums debuted at Fragranze in Florence just a few short weeks ago, and instantly commanded the attention of the niche perfume community. In bringing this line to market, Goodsir joined forces with Creative Director Renaud Coutaudier and the pair worked hard to combine their creative sensibilities and intuitiveness to see the series come to fruition. Following the vast tradition of unique, artisanal perfume houses that have gone before them, Naomi Goodsir Parfums are created and hand-packed in France; presented in time-honoured glass flacons with black bakelite caps. To date, two fragrances constitute the Goodsir perfume portfolio: Cuir Velours and Bois d'Ascèse... both of which in terms of style and approach, manage to tippy-toe the line between the 'au courant', and the classic perfume pillars of the past. Cuir Velours is a Leather Oriental - one that opens with a striking 1930's apparition of waxy vermillion-painted lips and powdered faces. It has a delicate felt-like texture, and the steadily growing sensation of an ambery / tobaccoey warmth pressing up from beneath. A moderately bitter leather accord furnishes the scent with a whimsical sigh, and a scattering of papery immortelle blossoms; a certain spiced piquancy. 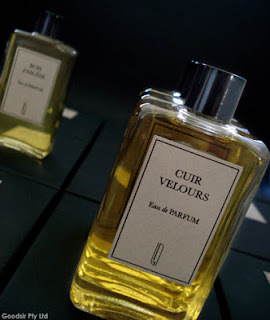 There is a comforting rummy syrupiness that grows at the heart of the scent... it intensifies until a rather wonderful transformation takes place: Cuir Velours suddenly shifts into a shower of sugar-dusted blossoms which tumble over a traditional oriental labdanum/vanilla base. The trail is satisfying and lingering, with flashes of bitter leather that re-emerge from time to time to keep the saccharine qualities in check. Whilst the beautiful floral heart is devoutly feminine in style, Cuir Velours can be worn and enjoyed by men for its tobacco warmth and deeply satisfying acerbity. Bois d'Ascèse loosley translates to "Wood of Asceticism"... "asceticism" meaning the practice of severe self-discipline and abstinence. I find this a fitting title to bestow upon this scent, as it is a wonderfully smokey, resinous, woody fragrance which calls to mind the many woods and incenses burned in ascetic rituals that span from the pagan to the ecclesiastical. Bois d'Ascèse opens, however, with a quality very familiar and quite personal to me and my profession - it conjures memories of hours spent rummaging in art supplies stores; heavy oak shelves lined with papers, the smell of sweet gouaches in tubes, sharpened pencils, and dry conté sticks by the dozen. This indulgent recollection is quite fleeting though, as a fine grey ribbon of smoke meanders its way through the topnotes, imbuing the composition with a dry, coal-like texture. Bois d'Ascèse is a spectacular scent with a an emphasis on charred cade wood, bittersweet tobacco leaves and beautifully unfolding resins. Its glorious oakmoss / frankincense base makes for a fragrance which not demonstrates a cognizance of perfume-making tradition, but also rivals the best I've smelled in a long time. The nose behind Cuir Velours and Bois d'Ascèse is Julien Rasquinet - trained by perfume royalty, Pierre Bourdon. A third perfume is already in the works, Nuit de Bakélite, and this time it is Isabelle Doyen of Annick Goutal doing the honours. Naomi Goodsir Parfums excite and enchant every bit as one of her exquisite handbags or made-to-measure chapeaus. Her perfumes are currently being rolled out to select perfume retailers globally. In 2009 when international bestselling author M.J. Rose approached me through the Sorcery of Scent blog, I could never have conceived the rewarding association that was to unfold. 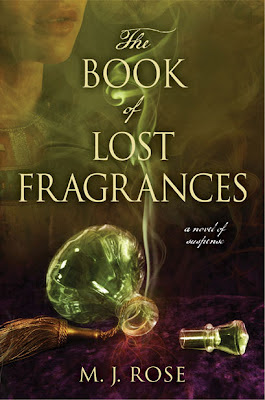 Whilst assisting her as a contributor for her gripping new novel The Book of Lost Fragrances, I discovered that M.J, much like myself, has an intense love of perfume... one that transcends the physical world of exquisite flacons and enchanting topnotes, and instead, celebrates the ethereal and the implied. Perfume, as we understand it, is the one thing that possesses the incredible ability to bridge the gap across time. Ex-lovers can be remembered, special events recalled and locations recollected, all in an instant, and all at the command of one single drop. But what if it could take you back even further? Back to a time beyond your earliest recollection? A time when your memories are both foreign and familiar in equal measures? Today, M.J. Rose launches "The Book of Lost Fragrances" - a suspenseful novel which explores reincarnation, twin souls and enduring love across the ages. It is a compelling page-turner that will have your heart hammering as it darts across continents and epochs, exploring characters who are connected in more worlds than one. This novel will be adored by readers of M.J. Rose's Reincarnationist series, and appeal to book and perfume-lovers the world over. M.J., I wish you every success!